The CANON EOS 18 to 55mm IS STM 24.2 MP DSLR camera takes photography to a whole other level. This camera makes it possible for you to shoot pictures and videos with professional quality. It gives you the highest standards with amazing technology so that you get only the best. The method of operation of this camera is simple and can be easily mastered, leaving you with only one job: being creative. Pamper your creative side with this camera that gives you the lease to do so. No more struggling with the handling, as this work of art has a body that can be used even by those with small hands. It has a low weight, so you don’t tire holding it up when waiting for your subject to get into a position you deem desirable. You can even shoot videos in Full HD resolutions that are ridden with details and sharp. These videos stay true to life and are beautifully bright. Capturing fast moving subjects with blur free precision in no longer a mean feat. This camera features a 24.2MP CMOS sensor that makes all the products of your creativity shine. The camera also features a 3inch monitor that frames your capture perfectly, so you know exactly what you are capturing. The CANON EOS 750D comes with a powerful 18 to 55mm STM lens that gives you a great picture every time, thanks to its astounding focal length. This lens has a wide aperture range that lets you shoot in almost any lighting condition. Whether you’re looking to capture the dark magic of the dusk or the revitalizing beauty of dawn, the ambient light is never too much or too less with this camera. This lens makes capturing razor sharp pictures a common occurrence on this camera. This camera is equipped with the Hybrid CMOS AF III focus system, that ensures precise automatic focusing. The camera is capable of recognizing up to 19 individual focal points within a frame. 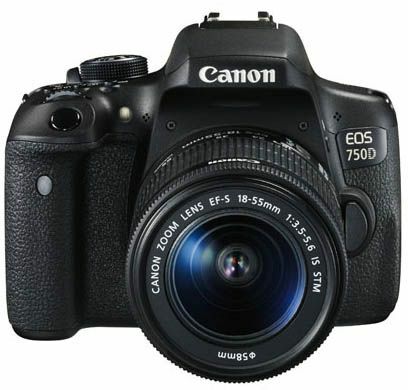 The CANON EOS 750D is equipped with an effective CMOS sensor that is highly sensitive. This sensor is a 24.2MP unit and ensures that you get high resolution pictures and videos. This sensor doesn't leave a single stone unturned when giving you pinpoint precision when it comes to accuracy of detail, sharpness, and contrast. It produces images of professional quality and with a high resolution. The high standards of clarity are maintained when it comes to video recording too, and what you receive are videos that reach Full HD resolutions. This camera possesses a 3inch monitor that gives you vivid and sharp representations of your frame, so you know exactly what you’re about to capture. This CANON EOS 750D camera stops at nothing in giving you the perfect picture. It is equipped with cutting edge technology that renders optimum performance so that you get only the best. Capture images at high resolutions and with perfect details. These images truly capture the essence of your pictures with photographic brilliance. You can also record Full HD videos at high resolutions. It supports video recording in MP4 and HDR formats. It also gives you a number of automatic shooting modes for ease of use. Choose from the various modes for a personalized touch. You can shoot at a speed of five frames per second in the continuous shooting mode. This superb camera comes with a number of unique features that make everything so much easier. It features the Flicker Detection technology that makes all your pictures look neat and crisp. This camera has compact dimensions and a low weight; both these aspects make the camera comfortable to hold and handle. It has built in WiFi support for easy sharing. You also have the latest and cutting edge NFC technology that lets you connect your camera to any other NFC enabled device with just a touch. This is a wireless, quick, and simple way to transfer data. This review is based on 2 months of usage of this camera, and I'd like to make it clear straightaway that I'm no professional. But it also goes without saying that I did my research before closing in on the 750D (T6i in the US). Straight off the box, I knew I had just found a new friend. The Canon 750D is a very capable machine, and is an excellent choice for a beginner. The learning curve to get a grip on the basics of this camera is as simple as it gets. The 18-55 mm STM lens that comes alongside the body meets the general requirements for a daily use. It takes some pretty neat video as well. To keep it short, the camera works as advertised and I'm happy. I however wouldn't advice the use of any ISO>1600 (Upto 800 is optimal). The images I've posted should give you a fair idea on how it performs (All taken on an 18-55 mm). First thing to keep in mind is to not expect the photos to be of the same quality and the sharpness as the ones that pop out of a high-end camera like a 5D. They're priced higher for a reason. We're the guys on budget, and with a little patience and learning, we can produce some top notch stuff. I'd recommend a Canon EF-S 55-250mm F4-5.6 IS STM Lens for Canon SLR Cameras almost right away, because a zoom lens is a must if you want more mobility with your camera. The Canon EF50MM F/1.8 STM Lens for Canon DSLR Camera is one of the best lens available for its price, and it should be next on your list. And no matter how stable your hands are, you can't replace the need for a tripod at higher shutter speeds. The Dolica GX600B200 Proline GX Series 60-Inch Aluminum Tripod and Ball Head Combo for DSLR is a good budget tripod given you have someone living down in the states (Trumpland), because for whatever reason, it costs a bomb here. The 8gb memory card that comes along in the box isn't nearly as quick or sufficient, so a new memory card(s) should be on your list too. I would also highly recommend Tony Northrup's DSLR Book: How to Create Stunning Digital Photography to get a hold on the various aspects of a camera and the resultant photographs. And if you still have money to spare, invest it on a better flash. Lightroom and Photoshop will help take your photos to a whole new level, so it's something you'd want to learn as soon as possible. If you still haven't decided about the camera you're going to buy, then the general comparisons below might help. At this price point, the other cameras you would/should be considering are : Canon 700D, Nikon 5300/5500, Sony A58/A68 & the Pentax K50. Starting off with the most basic question before buying the 750D, is it really worth an upgrade over the 700D? Honestly, I don't see anything revolutionary between both the cameras. The picture quality might be slightly improved, but it isn't really noticeable. The 24.2 MP on the 750D might sound light years superior to the 18 MP on the 700D, but trust me, it doesn't really matter that much to the average person. The image quality is same, to the most extent.The Megapixel count would only matter if you're onto really large size printing. The battery life isn't improved on the 750D either, and it's just bad when compared to what the other cameras offer at this range. It does come with the new Wi-Fi connectivity however, and it's pretty handy when it comes to remote shooting and sharing pictures to other devices on the go. Also, the 750D has more cross focus points, and more focus points in general, and that I would consider an actual upgrade. As a result focusing is slightly improved, with reduced shutter lag. Also the 18-55 mm kit lens comes with the STM version and it's pretty good for making decent videos due to it's silent and improved focusing (I'm into making videos as well, so this was a major plus point for me). Low light photography is slightly improved with a better effective ISO, but again, don't expect anything revolutionary. Most of the other core features are pretty much the same, and the 700D costs lesser, and it comes with Dual Lens. It would be wise to invest in more glass, than spend the extra bucks on a slightly improved version with just the one lens. I'd advice you to go for the 750D only if you get a good deal on it. I got it for 42k during the Diwali sale (Cracker of a deal), and the price was comparable to the 700D with the 18-55 STM lens, and as I mentioned earlier, the STM is a big plus for me. The Nikon 5300 & 5500 are better than its Canon counterparts in almost every aspect, and don't hate me for saying that. I'm just stating the facts and what's on paper. Nikon is the clear winner in terms of photo quality and sharpness. It can also work effectively on relatively higher ISOs, giving you that edge in low light photography. The battery is phenomenal, and it'll last you almost twice as much as on a Canon. Focus is debatable. The only thing that is off putting in either of the Nikons is their video performance, even though it offers 60fps at full HD (Which Canon doesn't). The auto focus isn't effective at all during video shooting. And if video is also a priorirty for you, then you'd want to be on the safer side and go with the Canon - STM lens combo. But overall, the Nikon 5300 & 5500 simply offer better quality and features than the Canon 700D/750D/760D at this price range Relatively less popular in the competition at this price range, the mirrorless Sony A58 & A68 offer good capabilities, especially when it comes to focusing. They also take pretty decent video, probably the best amongst the four, though its hearsay. The only disadvantage is the lack of availability of cheaper lens to upgrade your set-up in the future (In the Indian market at least). The Pentax K50 is also a beast at this range and has the quickest shutter speed amongst the four (1/6000), though 1/4000 should be sufficient for the most of us. It's the only weather sealed camera at this range and fares marginally better than the 750D in low light. I did get my hands on the K50, and clicking a picture while viewing through its pentaprism viewfinder was an absolute delight. At 16 MP, it's the lowest we've come across so far, but it should do fine. Lack of quality service across all the cities might be a major drawback, so you could find out a little more about that. *I would strongly advice you to test all of the above discussed cameras to find out which one's best for you. In the end it all comes down to your personal preference, because on paper is one thing, and in your hand is another. On a sidenote, whichever camera you pick (The Nikons, the Canons, the Sonys bla bla) in this range, I can assure that you'll still end up being a very happy customer. All of them back decent enough features to get you started on your journey. *To the newest of newbies who are still confused as to why someone would buy a dslr instead of sticking to your smart phone camera or some other point and shoot, the breakdown is quite simple. In your regular cameras, the camera takes the picture for you. Whereas here, you take the picture yourself. In other words, you are the captain and you own the damn sea. And once you start learning, you'll realize that the camera isn't even the most important element behind a photograph, but it is you, the artist. The camera plays a part too, obviously, but just not as big as you'd think. And needless to say, photography is an absolutely wonderful place to be in. Capturing stories, all within the four corners of a frame, it's just too damn poetic and beautiful. And If I can be of any help regarding any aspect of this camera, I'd love to help. The kit lens only can zoom upto 3x. Great Body!!! Great Quality! Great for video!